'Journalist' Ayat Oraby: Mainstream or Extreme? American Islamist Ayat Oraby applauded the mass killing of Egyptian police officers last month. On October 20, 54 Egyptian policemen were killed in a firefight with "militants" in the desert, 80 miles from Cairo. Local media reported the police were attacked by the Hasm Movement, a terrorist organization that the Egyptian government claims is linked to the Muslim Brotherhood. Governments around the world offered statements of sympathy to the Egyptian government over one of deadliest attacks against Egyptian security forces in many years. The U.S. State Department announced that it "condemns the terrorist attack," "[offers] profound condolences," and "stands with Egypt at this difficult time, as we continue to work together to fight the scourge of terrorism." But among some Islamist activists in America, there was jubilation. 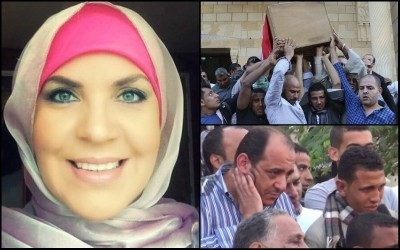 In a Facebook post, written on October 20, New York-based journalist Ayat Oraby applauded the killings, accusing the deceased soldiers and police of insolence and cowardice. In another post about one of the murdered soldiers, Oraby expressed "Joy at the death of that criminal!" Oraby accused the deceased soldiers of having previously been paid by Egyptian General (and now President) Abdel Fattah el-Sisi to murder unarmed Muslims during the infamous Rabaa massacre in 2013, during which supporters of the deposed Muslim Brotherhood President, Mohamed Morsi, clashed with Egyptian police and military. Oraby is a prominent figure. She serves as the editor-in-chief of Noon Al-Niswa, the "first Arab American Women's magazine." In 2013, Noon Al-Niswa held an event to celebrate its first printed issue after being an exclusively online publication. According to another Arabic-language online publication, the event was attended by self-styled "human rights activist" Linda Sarsour, former Deputy Secretary of Energy Randa Fahmy Hudome and New Jersey state senator Barbara Buono. 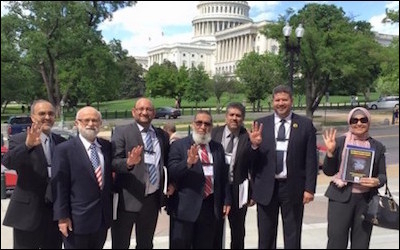 Ayat Oraby (far right) and other Islamists flash the four-finger "rabia" Muslim Brotherhood sign during a long day of lobbying on Capitol Hill in May. In her capacity as an editor, Oraby has won the Shirley Chisholm Award in journalism (awarded by New Jersey Assemblywoman Sheila Oliver), and been invited to speak on college campuses all over North America, including at Concordia University, University of Toronto, and Montclair State University. At her Montclair State talk, Oraby was billed as an "Activist, Journalist, Broadcaster & Advocate for Arab women." What sort of activism does Oraby practice? In a 2016 Arabic-language video on her Facebook account denouncing Egypt's Coptic Christian population, she declared that "the Crescent must always be on top of the Cross" and urged her audience to "Boycott the Christians economically." Oraby's Facebook posts, meanwhile, include virulent anti-Semitism. She claims that Israel has taken over the Middle East, and that Egypt's former president Gamal Abdel Nasser was "a Jew" and an "American Intelligence agent." The Council on American-Islamic Relations (CAIR) has a long history of commenting on hate speech issues. But when we asked CAIR's national office and its New York branch to comment on Oraby's extremism, they refused. CAIR was founded and remains run by Muslim Brotherhood members. Its refusal to condemn this anti-Semitic, anti-Christian and pro-terror rhetoric is explained by Oraby's own history of involvement with the Muslim Brotherhood. Oraby's Twitter profile lists her as a member of the Egyptian Revolutionary Council (ERC), a Turkey-based organization that supports Egypt's ousted Muslim Brotherhood president, Mohammed Morsi. Although Oraby claims she is "not with Muslim Brotherhood," Oraby's membership in the ERC indicates otherwise. When ERC first formed, at least one Egyptian English-language paper announced, "MB supporters launch revolutionary council." Another Arabic-language paper describes Oraby as an "active member of the Muslim Brotherhood." It is time for political leaders to condemn Oraby's extremism and revoke her awards and accolades. Furthermore, Oraby has lobbied Congress alongside MB activists who endorse the boycott of Copts, later showing up in a photo with them displaying the four-fingered Muslim Brotherhood gesture. Oraby has praised Muslim Brotherhood ideologue Sayyid Qutb as an "intellectual" and a "martyr." And, both of her Facebook profiles feature pictures of Muhammad Morsi as the cover photo. She even captioned her personal page's photo of Morsi with the declaration, "We still consider you to be the legitimate president of Egypt." Ayat Oraby is no journalist or activist. She is an Islamist propagandist and an apologist for terror. She should be stripped of her Shirley Chisholm Award, disinvited from speaking on university campuses, and deprived of the credibility of senators and stateswomen. We contacted Assemblywoman Oliver, who runs the Shirley Chisolm Award, but received no response. It is time for political leaders to condemn Oraby's extremism, and revoke her awards and accolades.